I couldn't be more proud to partner with a company like Sealed With A Kiss Designs for the Project Plus monthly contest. They are a company that steps outside the boundaries and features women we can all relate too while also keeping all image editing to a minimum while promoting "Plus Fashion. Unedited Beauty". I'm just so proud and wish more companies would follow suit. I read every Project Plus entry and out of the hundreds this month, there was one girl that stood out to me. It wasn't until I was 24 that I realized the same thing as her, it was ME and my mindset on how I viewed and accepted myself. Please take a minute to read her winning story. 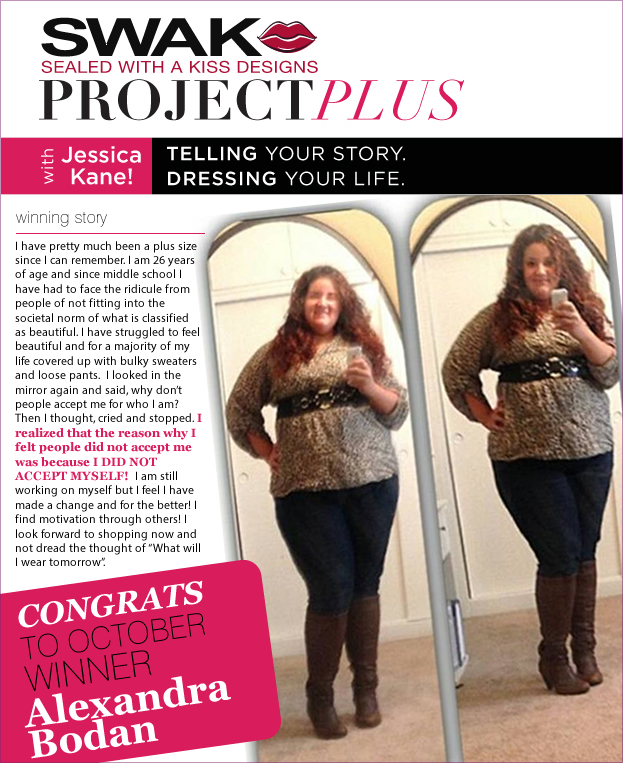 I'm excited to announce October's winner, Alexandra Bodan!! She's going to receive a mini-wardrobe from SWAK!! I'm so proud of all the women who entered and thank you so much for sharing your life with me every month. I'm thinking about next month and need ideas on a theme, would love your input! What do you think? Learn more about my partnership with SWAK, "Project Plus"